Let's get it done! COME ON CHELS!!! Abraham for the next season, please. Nothing to worry about his performance. Playing against the best team in the league and a team that played in the CL final last season isn't easy and acceptable. Especially when we were defending since the first minute. Sarri should keep playing him until the end of the season. We could feel that we lost some aggression in our defence, we weren't strong enough in the air. I believe if he was still on the pitch, he could offer us more in the first goal. We can't blame the players, it's clearly Sarri's demands. He wants us to keep Liverpool strong and defend with the whole team. Liverpool will try to push higher and they have guns on the bench, we survived in the first half, but I believe we can make it. We just need a striker who will sit on Van Dijk and Matip, Hazard must have his freedom. I got a good feeling of Higuain in this game, I don't know why. We have to try press them more on their half and believe until the end! COME ON CHELS!!! Keita - Fabinho - Henderson midfield, not so much speed but the ability for a long ball towards their trio in the attack. Physical battle in the midfield is a must, going to be an excellent match. Hell yeah! Great lineup, let's do it boys!! COME ON CHELS!!!!! City are leading and probably are going to win that match, was boring first half. Pressure on Liverpool could work for us. From what I heard and saw, Boga isn't that bad at Sassaulo. Our record at Anfield is pretty impressive, last time they won us there was in 2012... We can really destroy their title hopes and put us strong in top 4, we have to respect ourselves and make that happen! Liverpool are playing very good football and we have to respect them, but it doesn't mean we should be worse than them. Sarri finally starting to play some fresh players and we could see how we are looking when we play our regular lineup, boring football without creativity against a low opponent. 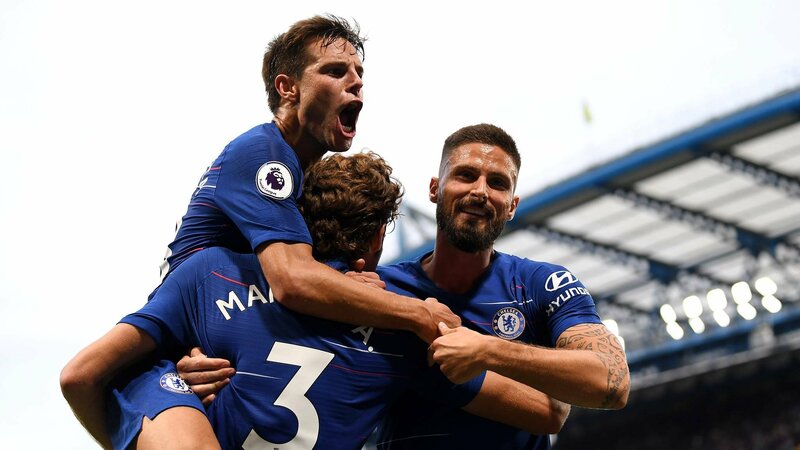 I'd like to see this starting lineup: ---------- Kepa ------- Azpi - Rudiger - Luiz - Emerson - - Kante -- Jorginho -- RLC CHO ---- Hazard --- Willian CHO should taste some real tough football and fight for the team the same as RLC. I will go with Hazard as our striker because we have poor options at our attack. Let's make that happen boys! COME ON CHELS!!! Can't believe that was Chelsea playing in the first half. I can't name a player that actually performed well and did something for the team. It looks like the players aren't interested in playing, only Willian has made some moves and tried to score. We are everywhere on the pitch, totally control the game but we have to double the score because 1-0 is too small. We deserve to score more, we play better and look good, let's hope we will start the second half with more hunger to score more. COME ON CHELS!! !